Pine Belt (WDAM) - The Storm Prediction Center has increased the severe weather risk for our area. The Pine Belt is now mostly under an enhanced risk with our western counties under a moderate risk for tonight and into Sunday morning early. That means most of the area is a 3-out-of-5 on the 1-to-5 scale where five is the highest risk for severe weather. A few western counties, like Lawrence, Jefferson Davis, Walthall, Simpson and Smith are under the 4-out-of-5 Risk. The National Weather Service is anticipating, in their words, “a severe weather outbreak” today. That doesn’t mean guaranteed tornadoes, but it does mean the atmosphere is ripe for the development of severe weather and a lot of storms today will have a big punch, even the non-severe storms. Model data agrees that an organized severe weather outbreak is likely for the Louisiana-Mississippi region, but not as much of a slam dunk for the Pine Belt specifically. That means that we need to keep a very close watch on the weather, but there is still a small chance that the Pine Belt will be between the roughest weather, and not actually receive the roughest weather. Because of the threat for severe weather, the First Alert Weather Team has designated Saturday as a First Alert Weather Day. Wind from the southeast will pick up during the day on Saturday, pooling warm and moist Gulf of Mexico air in the region. The thunderstorms this morning across parts of the area were a good indicator of just how volatile the atmosphere is. Most models last night showed that as just plain drizzle. And a lot of people, myself included, were woken up around 3 a.m. to 5 a.m. by the thunder. 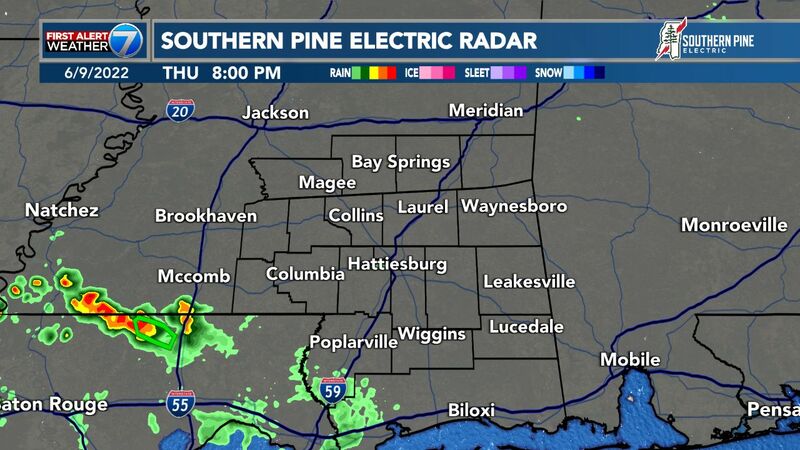 For the Pine Belt, it looks like there may be enough of a lid on the atmosphere to hold thunderstorms down until after 8 p.m. tonight. As a cold front approaches, it will open the door for showers and storms to start in the evening and continue into the overnight hours and into Sunday morning. Once the front passes through early Sunday morning, the threat should cease. The computer model data continues to suggest this is a heavy rain and wind event. With straight-line wind up to 70 mph possible and up to 1.5 inches of rain. Unfortunately, tornadoes will also be possible, too. Since the storms will be moving through the area as a broken line, there may enough space within the line - as well as upper-level wind support - to have rotating updrafts and embedded supercells. One concern is that the atmosphere will be capable of supporting long-track and devastating tornadoes. Right now, the question is will it be able to produce those types of tornadoes in our area. Localized flooding may become a concern, too, as rainfall rates will be quite high in some of the intense storms. 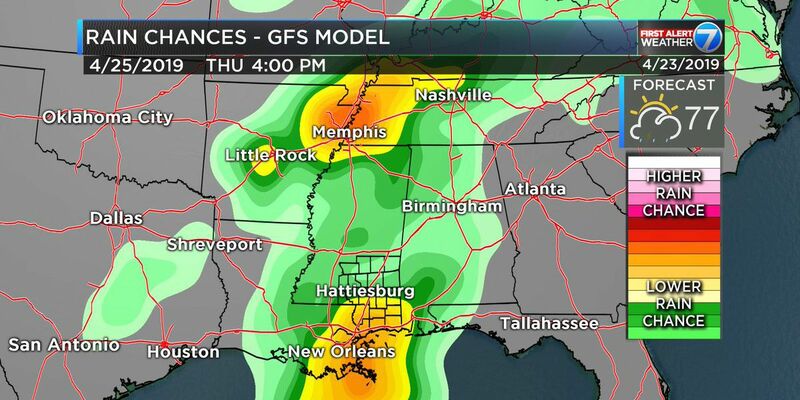 Regular rain may be hit and miss through the afternoon, but the threat for severe weather for the Pine belt will be between 8 p.m. tonight and 5 a.m. on Sunday morning. The big question is when does the handful of supercells in Louisiana congeal into a line of storms. That will really dictate just how severe our weather gets. If the line remains very broken and there are discrete, lone storms moving into our area instead of a line, that may increase the threat for severe weather. While if the storms are all clustered together in a messy line, that would decrease the risk. And we still can't know exactly where the strongest storms will be. For more scientific information on this - and other - forecasts, you can get extra details and a complete scientific breakdown over on Nick's Blog.